on 24th June 2010. Click to view. There are some more interesting contradictions emerging concerning the contracting of the Conservative Administration’s most high profile "consultant" and whether he was a council employee or simply a consultant. This raises further concerns about all sixty-nine consultants and how H&F Council is dealing with the potential fines it could suffer from Her Majesty’s Revenue and Customs. ALMO. 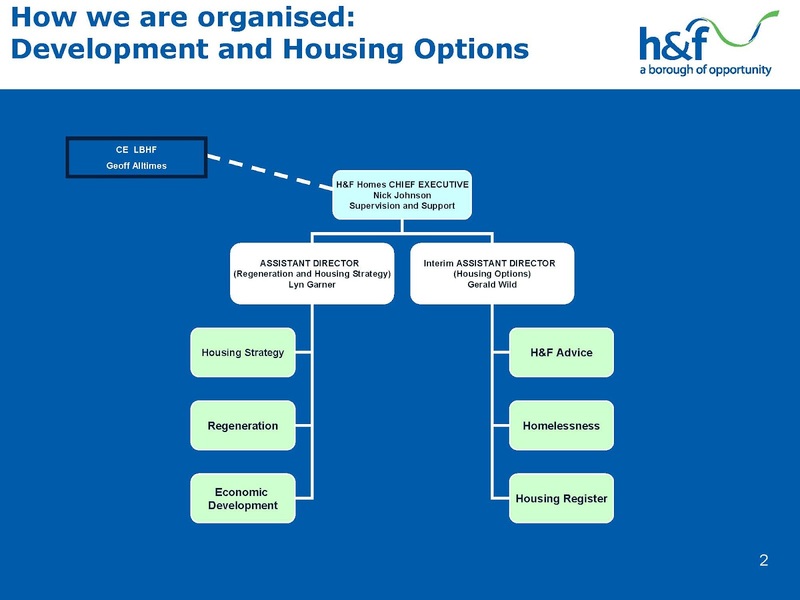 Nick Johnson is listed as "Chief Executive"
But, on 24th June 2010 Nick Johnson gave a presentation to the Borough’s Housing Health and Adult Social Care Select Committee. 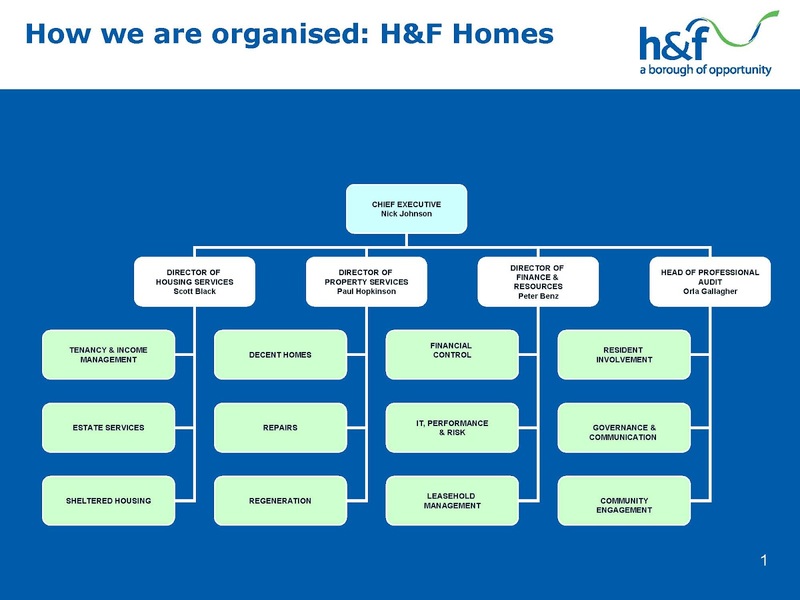 He presented two management charts: one for the Council’s housing management team and one for H&F Homes - the Council's ALMO. He is on both. He also told the committee that “the provision of supervision and support of the two Assistant Directors had transferred to him” and that he had taken on this additional “full time” role following a personal request from Geoff Alltimes - who was H&F Council’s Chief Executive until last autumn. And, on the 24th September 2010 Geoff Alltimes wrote to me to advise he and the ALMO Board “concluded jointly that Nick should have two separate contracts, one with the Council for managing the Council’s housing and regeneration functions and the other as continuing interim Chief Executive of H&F Homes.” So there is little doubt that Nick Johnson had been “managing the Council’s housing and regeneration functions” and had consequently played a senior role as part of H&F Council’s team of directors. 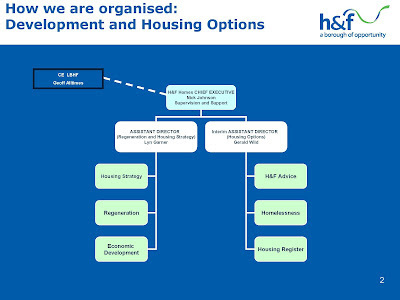 All the evidence demonstrates that Mr. Johnson was not considered as a consultant during his time “managing the Council’s Housing and regeneration functions” either. So how many other “consultants” and agency workers could there be issues with? All of this raises deep concerns that H&F Council is not addressing its previous dealing properly. HMRC can investigate organisations going back six years. The Council admits its hiring of consultants was a mess in the past but when my Labour colleagues and I question officials about getting all H&F Council’s tax affairs in order responses come back telling us “the Council will in future meet HMRC requirements." When we raise questions about the employment of long-standing consultant/employees it is not okay for officials to bush these aside with assurances that some people are now “defined as consultancy under the new procedure” - which only came in last August and still has some way to go before it can be considered fit for purpose. Yesterday I noticed that a senior official had written a message to all employees on H&F Council’s intranet. That included the sentence “The council’s processes are now squeaky clean. Any suggestions that things weren’t done properly in the past is merely a criticism of the paperwork rather than any criticism of substance.” Rather staggeringly that statement was flatly contradicted only last Thursday at H&F Council's own Audit and Pensions Committee. The members of that committee were presented with a report that concludes: “The use of consultants was raised in the Annual Governance Statement last year. While some improvement has been made there continue to be weaknesses in managing contracts for consultants.” It goes on to say, “existing consultants’ contracts have been reviewed and HR is in the process of converting these, where appropriate to new contracts in line with the agreed procedures.” So the current situation is hardly “squeaky clean” then? And we still have the matter of cleaning up H&F Council’s tax and consultants dealings over the last six years. None of this inspires confidence. I have told officials that should Labour be elected to form the new Council Administration in 2014 I will not look kindly on them if this issue is still a problem. H&F Council needs to carry out a full internal investigation going back the full six years. It needs to deal with any back taxes and demonstrate to HMRC how it has dealt with all its previous failings and is therefore not in line for a very large fine. The sooner they do that the better.